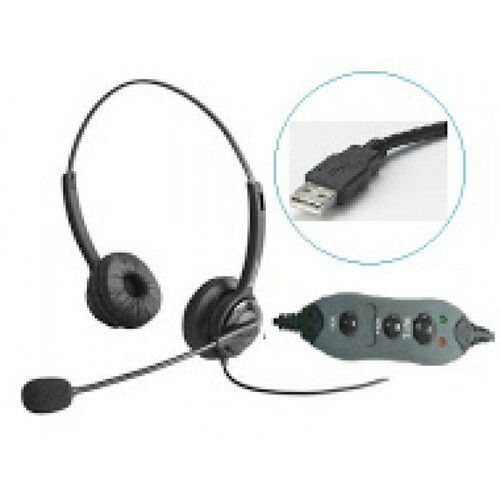 Being a famed organization of the market, we are engaged in offering an all-encompassing range of VoNia D577Call Center High Noise Cancellation USB Headset. These are designed in tandem with the defined industry norms using high grade plastic and other base material. In order to cater variegated demands of clients, these headsets are available in various technical specifications and at market-leading prices. Extremely lightweight design, one of the lightest in the world. Stay put click stop headband for a perfect snug fit. Made of high strength engineering plastics. Highest degree of flexibility and float to ensure the best fit on all types, shapes and sizes of head. Best in class flexibility of the boom mic tube ensuring perfect positioning of the boom mic on all call conditions. Compatible with all types of phone systems such as digital, IP, analog. Noise canceling compared to any other product. Best price- performance ratio in the market today. Quick Disconnect Jack with the inbuilt mute button. Both foam and Leatherette ear cushions available. Stay-put click-stop headband for a perfect fit. Established in 2011, Fidem Technologies is one of the distinguished and notable enterprises highly indulged in Trading of world class products comprising VoIP Phones, VoIP Analog Gateways, VoIP Asterisk Cards, VoIP GSM Gateway, Networking Equipments, Wireless Solutions, Network Storage Solutions, Switches, router, Firewall, Media Convertors, E1 Modem, call Center Headsets, Server racks, Workstation, Network cables, Fiber Cables, Structured Cabling systems, IP communication systems, and many more. Furthermore, our competency to alter our services in harmony with the needs and demands of our patrons and reasonable pricing has accomplished us enormous customer base all over the nation. Fidem Technologies is dealing in VoIP Hadware, VoIP Equipments, Networking Equipments, AudioCodes Gateways, AudioCodes Mediant gateways, AudioCodes Phones, Network Server Rack Solutions, Cisco Network Switch, Cisco Voip Phone, Cisco IP Phones, Cisco Phone Headsets, Cisco Wireless Access Points, Cisco Router, Cisco Switches, Cisco Unmanaged Switches, Cisco Smart Switches, Cisco Managed Switches, Cisco Stackable Switches, Cisco Catalyst 2960-S and 2960 Series Switches, Cisco Wireless Access Points, D-Link,D-Link Switches, D-Link Network Cables, Digium Card gateway, Digium Analog Cards, Digium Digital Cards, Digium Gateways, DigiumVoip Phone, Digium TE133F, Digium TE235F,Digium TE435F and TE820F,Digium Switchvox, Grandstream Phones, Grandstream VoIp Gateways, Grandstream IP Surveillance, Grandstream IP Phone, Grandstream IP Pbx, Grandstream Video Phones, Grandstream VoIP Adapters, Netgear Computer Networking Products,Netgear Green Storage Solutions, Netgear Switch,network Switches, Managed and Smart Switches, Unmanaged switch, Wireless Access Point, Engenius Wireless Access point,Patton Analog Gateways, Patton Digital Gateways, analog Phones, Plantronics wired headset Accessories, Plantronics Quick Disconnect Cords headset, Plantronics Binaural Headsets, Plantronics Lync Headests, Plantronics Wired USB RJ09 Telephone Headset, Voip Headset and Voip Headphone, Plantronics Softphone Noise cancelling Call Center Headset, USB Computer Headset, Plantronics Wireless Headsets, Plantrnics SupraPlus Wideband headset, Polycom Conference Phone, Polycom ip Phones, Ruckus WirelessAccess Point, Ruckus ZoneDirector, Ruckus ZoneFlex, Sangoma Card, Sangoma PRI card, Sangoma Analog Cards, Sangoma Digital Cards, Sangoma NetBorder Express Gateway, Sangoma NetBorder Transcoding Gateway, Sangoma Session Border Controllers,Sangoma Vega Gateways, Sangoma Vega 400, Sangoma Vega 50, Sennheiser Corded Headsets, Digium Sangoma Digtial E1 PRI card, IP Phone, Yealink IP phone, Cisco SIP Phone, Vonia Headsets,Voxitone Headset, Telekonnectors Headset, AMP Cat6 Cable, Molex CAT5, CAT6 Cables, Freemate Headset, Vonia Call center headset headphone, HP Networking Hardware, Matrix VoIP FXS-FXO Gateway, Cisco IP PHone headsets, Fanvil IP Phones headset, Avaya IP Phone Headset, Engenius Wifi solutions, Ubiquti Wifi Solutions, Dinstar GSM gateway, Call Center Dial, Call Center Solutions, Call Center Equipments, networking Server, IP PBX,VoIP Phones,VoIP FXS-FXO Gateways,VoIP Digital E1 T1 PRI Gateways, E1 T1 Digital PRI Cards, Voip CDMA GSM Gateway, Computer Telephone Headsets, Beetel Panasonic Phone RJ09 Headset, Call Center USB Headset,VoIP Solutions, Networking Hardware Solutions, Antivirus, Wireless Solutions, IT Infrastructure Solutions, Network Security, Call Center Applications, Dialer, Call Center Set-up Solutions, IP Telephony Solutions, Routing &Switching Solutions, Switches, Routers, Firewalls, UTM Boxes, Wireless, Voice Products, Voice Solutions, Video Products, Microsoft, visualizations, connectivity solutions, cabling solutions, cabling products in India and International Market.